School Consolidation and Notions of Progress: Why Community Actors Almost Always Lose the Fight to Keep Local Schools and How They Can Turn the Tables. Patricia W. Elliott, in education, 18(1), 2012. A Political Analysis of Community Influence over School Closure. Finnigan and Lavner. Urban Review, March 2012, 44:133–151. Speaking Out on School Closures. BC Teacher’s Federation. Will the Property Tax System Save Our Neighbourhood Schools? Tricia Bakken, Canadian Centre for Policy Alternatives – Saskatchewan, 2009. Rural Schools and Educational Reform: Should We Keep Rural Schools Open? A Review of the Literature. Prepared for the Ontario Federation of Agriculture. Dr. Allan C. Lauzon and Ms. Danielle Leahy, School of Rural Extension Studies, University of Guelph, Guelph, Ont. Where Does the Rural School Stand? Different Perspectives . Carolyne Tompson, Queen’s University Faculty of Education, 2011. Tracing Transitions: The Effect of High School Closure on Displaced Students. Kirshner, et. al., Educational Evaluation and Policy Analysis. 32(3), 2010, 407-429. The Detriments of High School Closures: Lessons From Longitudinal Data From Throughout Illinois. Billger and Beck, Illinois State University, 2009. ‘The status quo is not an option’: Community impacts of school closure in South Taranaki, New Zealand. Kearns, et. al. Journal of Rural Studies 25(1), 2009, 131-140. Education, Place and the Sustainability of Rural Schools in Saskachewan. Terry Wotherspoon, University of Saskatchewan, Journal of Research in Rural Education, Winter, 1998, Vol. 14, No.3, 131-141. An Institutional Analysis of School Closures in Saskatoon and Windsor. A. G. Phipps, University of Windsor, 1993. Political Economy of Rural School Consolidation. DeYoung and Howley, Peabody Journal of Education (67)4, 1990. 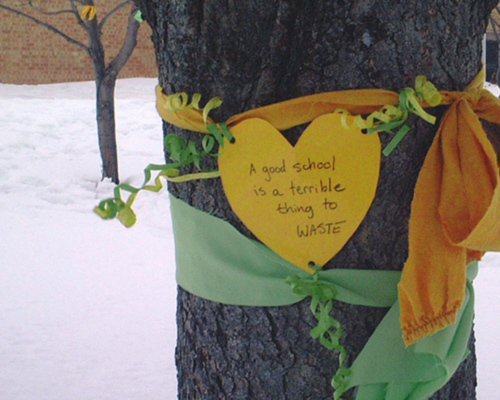 The Environmental Impact of School Closures. Richard Andrews, University of Washington, 1974.